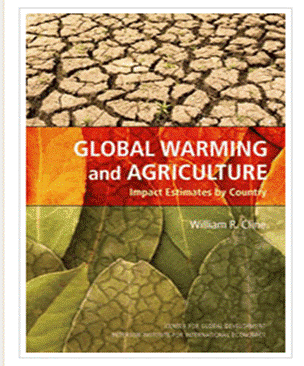 The 2007 Cline food security assessment was based on a global temperature increase of 3.3ºC. 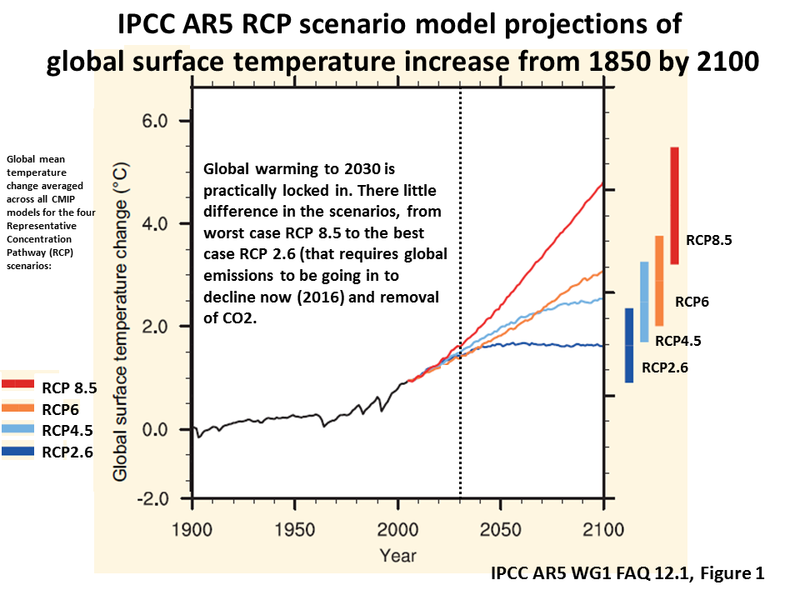 We are currently on track for a 3C rise by 2050. We are looking at the world that today's children will see. The climate models used in Cline's study predicted that under the IPCC's scenario A2 scenario (a high scenario as the world is on), that global mean temperature would rise by 3.3ºC, so these results are a for a global temperature of 3.3C. This is the increase that we are committed to by today's policy being the result if all national proposals were carried out (Climate Tracker). Because of the uncertainty of the potential carbon fertilization benefits to some crops in some regions Cline gave results for crop yield changes with and without fertilization benefits. Risk management demands that changes without fertilization would be the basis of food security security assessment, but instead the IPCC assesses based on the assumption of large CO2 fertilization benefits based on crop experiments of doubtful validity in the real world. Land areas would warm more than oceans, with the average surface temperature increasing by 5.0ºC weighting by land area and 4.4ºC weighting by farming area. By the 2080s, global agricultural productivity would decline by about 3% with carbon fertilization effect and by about 16% if the carbon fertilization effect did not materialize. These losses would be disproportionately concentrated in developing countries, which would suffer losses of 9% with carbon fertilization effect and 21% without carbon fertilization effect, in contrast to an 8% gain (with carbon fertilization effect) and 6% loss (without carbon fertilization effect) in industrial countries. The detailed estimates by country and region reported in Table 2 indicate that South Asia and Africa would be the two regions most harmed by climate change. 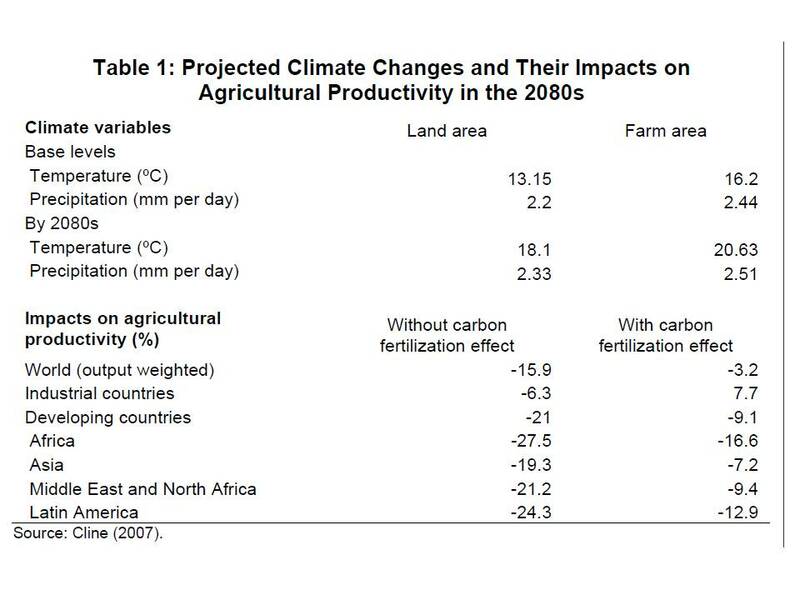 In Southeast Asia, the damages of climate change to agriculture would also be severe, ranking from 15.1% for Viet Nam to 26.2% for Thailand if carbon fertilization effect did not materialize..
William Cline is an agricultural economist. His report separates out the potential CO2 fertilization effect. However the report is on a global temperature increase of 3.3C and the ​IPCC says the CO2 fertilization effect no longer increases crop growth at 1.5-2.0C, therefore the Cline with CO2 fertilization does not apply. 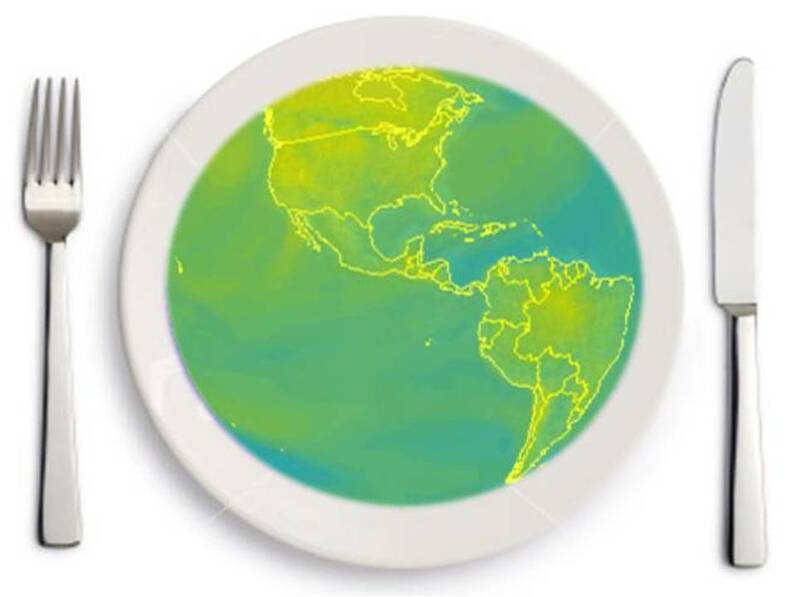 Today global emissions are tracking this worst case IPCC scenario. March 2014 A Challinor Nature meta-analysisshows that crop yields will fall sooner than projected and decline sharply with temperature increase. ​A comprehensive USDA study concludes rising temperatures could cost farmers millions as they battle new pests, faster weed growth and get smaller yields as climate change continues. WASHINGTON — Climate change could have a drastic and harmful effect on U.S. agriculture, forcing farmers and ranchers to alter where they grow crops and costing them millions of dollars in additional costs to tackle weeds, pests and diseases that threaten their operations, a sweeping government report said Tuesday. An analysis released by the Agriculture Department said that although U.S. crops and livestock have been able to adapt to changes in their surroundings for close to 150 years, the accelerating pace and intensity of global warming during the next few decades may soon be too much for the once-resilient sector to overcome. "We're going to end up in a situation where we have a multitude of things happening that are going to negatively impact crop production," said Jerry Hatfield, a laboratory director and plant physiologist with USDA's Agricultural Research Service and lead author of the study. "In fact, we saw this in 2012 with the drought." .A. Challinor Nature 2014 ​​A meta-analysis of crop yield under climate change and adaptation . This meta-analysis found that Climate change will reduce crop yields sooner than thought. This was also the conclusion expert review in 2005 and the reasons are much the same. ​Results were presented from a series of large-scale field experiments on crops such as maize, rice, soyabean and wheat, that show how increasing temperatures, drought and ground-level ozone concentrations (as predicted for the coming century#), will result in substantial reduction in crop yields, outweighing the beneficial fertilisation effects currently predicted from rising levels of atmospheric carbon dioxide. Growing crops much closer to real conditions has shown that increased levels of carbon dioxide in the atmosphere will have roughly half the beneficial effects that were previously hoped for in the event of climate change. In addition, ground-level ozone, which is also predicted to rise but has not been extensively studied before, has been shown to result in a loss of photosynthesis and 20% yield loss. 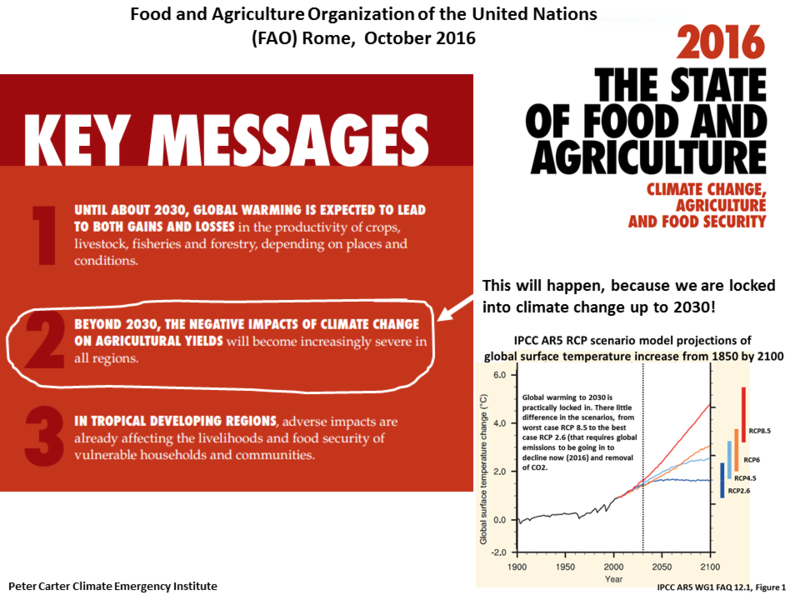 : Both these results show that we need to seriously re-examine our predictions for future global food production as they are likely to be far lower than previously estimated. 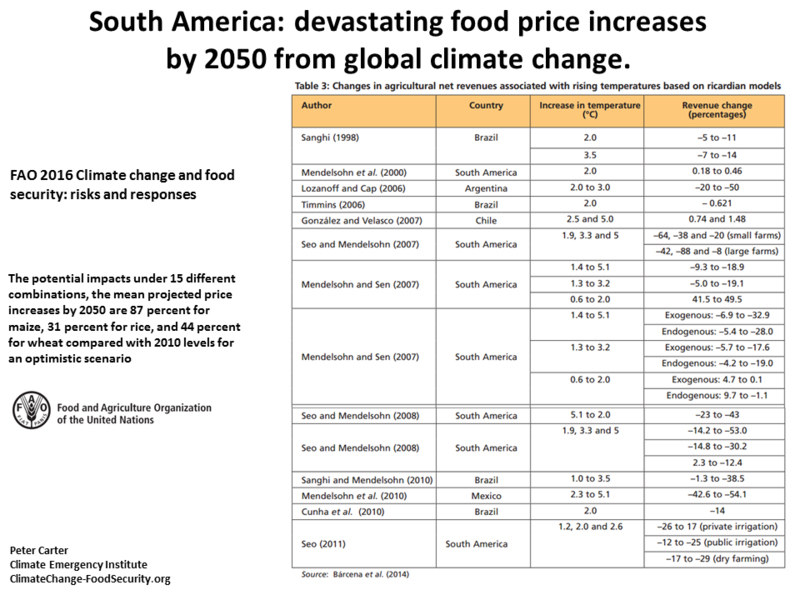 2015 USA Climate Change, Global Food Security, and the U.S. Food System. Food security for the world will largely depend on the effects of global climate change on US agriculture. ​The USDA assessment shows that up to 2050 effects on the US food production will be mixed, with some large adverse impacts affecting some regions some times, but after 2050 yields will decrease generally. ​'A review of studies conducted for the Fifth Assessment Report of the Intergovernmental Panel on Climate Change (IPCC) suggests that while positive and negative projections of impacts on crop yields counterbalance each other at global level until about 2030, the balance after that becomes increasingly negative'.